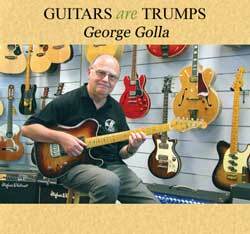 "After decades of playing every conceivable type of guitar I still get a thrill from these instruments. No other instrument takes the infinite variety of forms that the guitar does." These are the guitars that were used on this CD. They're all available at Trumps Music. The amplifier used was the Hughes & Kettner Duotone. It remained on the same setting for all tracks. Price of each CD is AUD$16.00, post and pack $5.00 per cd.